I bought an ice scraper today. We haven't had any measurable snow. But the recent snowmaggedon in upstate New York has me thinking that Old Man Winter is on his way. And I want to be prepared. As I see the leaves that need raking and the storm windows that need lowering, I can't help but think about nature's gradual reminder for us to slow down. In nature, many animals use winter as a time of hibernation. The days grow short and the nights grow long. The cold, snow, and ice provide opportunities for hunkering down, and for slowing the pulse of our hectic lives, for just a bit. Winter allows us time to slow down, to spiritually rejuvenate, to be wrapped around the warmth of family and friends, to quiet our souls, and to reflect. Sadly, this transition to a slower pace may be lost in the "busyness" of the fall and winter holidays, of ski seasons, hockey games and basketball tournaments. There is shopping to do, cookies to bake, presents to wrap and parties to plan and attend. We are busy. That is a fact. Instead of cultivating a lifestyle of constant movement and pressure to perform on one level or another, can't we take our cue from nature's hibernators and slow down, take the time to breathe, look around, and do the things that bring us comfort and joy? That is my challenge this winter, even if I capture only one hour per week. 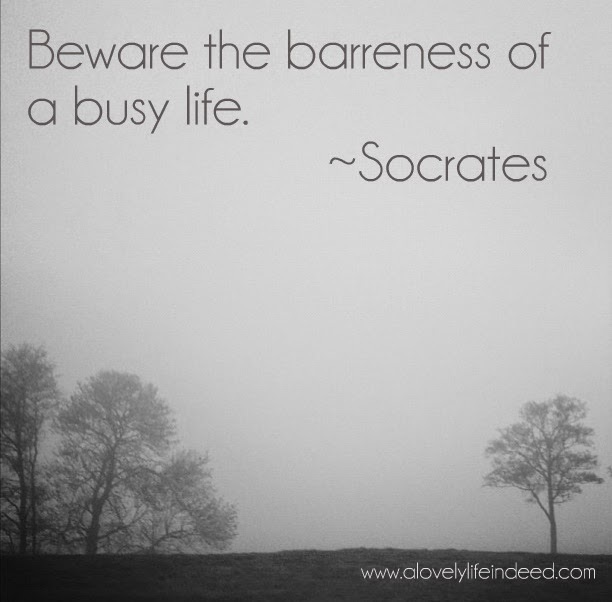 I want to savor every moment that I can; not squander it in the glorification of busy. Winter is for cuddling and conversation with my husband, for comfort food, over-sized sweaters and tall boots; for favorite movies, for walks in the snow, thick socks, hot soup, and red wine. It's for baking, and books, and blankets, and whatever else makes you smile. In waiting for the first flakes to fly, I promise myself to slow down, to breathe consciously, to act with intent, and to use winter's slow down to make quiet, loving memories that last long after the snow melts away. When spring calls us out of hibernation, I will be ready to greet the new season with a sense of rebirth and a rejuvenated soul. Do you find time to slow down during the winter? 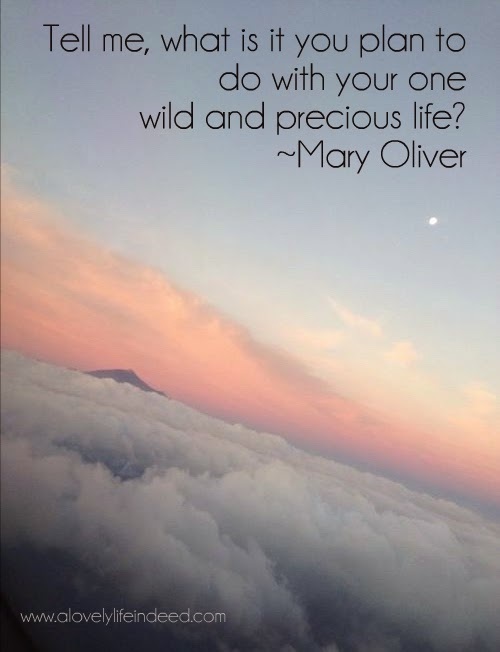 How do you slow your pace and stay in the moment? Kelly this is great! Two different forces are playing on us during this time. Society wants us to GO GO GO. Bu natures, what we were meant to listen to and absorb, wants us to relax, breathe and slow things down. So true! Thank you, Rebecca. It's finding the balance between the two that is key. Yes, we do slow down in the winter but not until January, LOL!! So many great holiday parties this time of the year!! And they are worth the running. Everyone has non-negotiables. Knowing them, enjoying them and living in balance is what's important. And when you do, Lynn, you will enjoy it, I'm sure. Thank you for stopping by! Have a great week! This is such a busy time of year and even though I work a job that requires me to be there no matter what the weather is, once I get there it is usually quiet. I'm hoping our snow holds off till January. Me too, Doreen. But we're expecting snow this week. :-( My husband is an essential employee for the state, so he doesn't get snow days either. Thank you for stopping by! Have a great week! "It's for baking, and books, and blankets, and whatever else makes you smile." Makes me wonder why people hate winter so much :) and then I remember it's the temperature! The temperatures and the snow..which we're expecting this week. #atleastitsnotBuffalo. Poor souls. Thank you for stopping by, Farin! Have a great week! Winter does kind of slow me down because it is so freezing cold. I can't take my daughter to playgrounds or ride bikes so we are inside a lot. The holiday season is busy but come January we definitely have cabin fever! Time to get creative. Maybe there's a local hotel with an indoor pool willing to offer a better rate...a mini getaway. :-) Thank you for stopping by, Karen! Have a great week! Winter came to quick in here in Ottawa, the roads are too icy to go for a walk. I like the snow but not when I can't go for a nice long walk. Will escape soon and go on vacation. I enjoy walking outside too. And you're right...ice makes it tough. Enjoy your escape...someplace warm? Sounds like heaven. Thank you for stopping by, Helene! Have a great week! When my husband rolled over and wrapped his arms around me this morning, I laid there for a few minutes thinking that bears are really onto something when it comes to hibernating. Last year when we drove 1,000 miles in one week to fit in all of the holiday everything with everyone, I thought, "This is too much, we don't even get to enjoy our home at the holidays." So we're trying to slow down a little this year and are encouraging a simplified schedule. Love that, Rachel! <3 Hibernating sounds better every day. Have a great week! You would think winter would slow us down, but for some reason at times it doesn't seem that way lol. I love winter and autumn..my favs for sure! Love the quotes! Winter is not my favorite. I'm a spring and fall girl. But I will concede that every season has its own beauty and specialness. Thank you for stopping by, Carolann! Have a great week! I always feel a little restored by winter...the introvert in me needs this season a lot. I totally agree Winter is slower but usually not until after the Holidays. I love just curling up with a book though and drinking a hot beverage on a snowy day. And watching the snow through a window is pretty. Cleaning off the car...not so much. Have a great week, Kerry! Chocolate makes everything better, Nikki. :-) Thank you for stopping by! Have a great week! If it was possible to hibernate, sign me up! We have had a lot of snow already in Erie, but nothing compared to Buffalo. The lake effect is really the weirdest thing. #atleastwerenotinbuffalo Poor souls. Thank you for stopping by, Chelsea. :-) Have a great week! Gorgeous. Your post reminds me, yet again, how much I miss the change of season. There is something restorative about burrowing in, slowing the pace... It is a gift to be still, in the quiet, to simply be. Thank you, Elin. Every season has its own beauty, I think...even winter. Thank you for stopping by! Have a great week! I would like winter more if it was not so cold.. Brrr.. We got several inches of snow where I live already (not like Buffalo though) and all I want to do is stay inside. #atleastwerenotinBuffalo Poor souls. Boston is getting snow on Wednesday. Just in time for Thanksgiving travel. Ugh! Thank you for stopping by, Pam. Have a great week! Yes I do like to slow down and cuddle up in the winter. My family on the other hand is go go go and everyone except me seems to get stir crazy! I get stir crazy, but I hate being cold. It's the curse of the Gemini. :-) Send the boys out to play and you cuddle with your tea and blanket. Hi Kelly, love each of your choices, well captured. 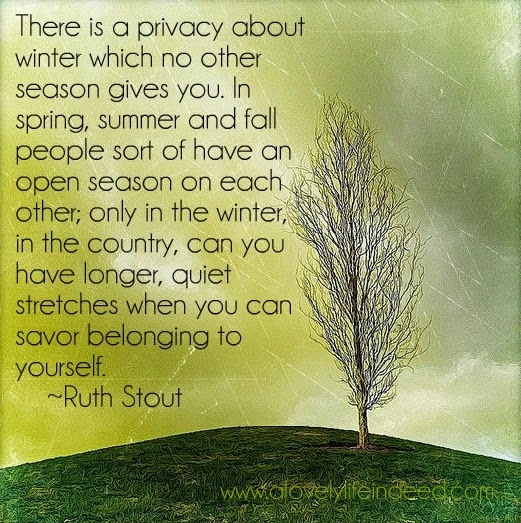 I've especially been reflecting on the privacy of winter, I love that saying and find it so true. I can few things I enjoy more than a book a cocktail and logs roaring in the fireplace (after dinner that is,lol) Really enjoyed your Posts this past couple of weeks. Thank you, Peggy. That's the one thing missing from our home...a fireplace or wood stove. But Netflix has a great fireplace video...Ha! Have a great week. It is so important to take time to reflect when we can - the end of the year is sort of a natural time to do so, as we close on the calendar and think about all we wanted to do, did do, didn't do - and regroup as we head into another very busy cycle beginning 1/1!